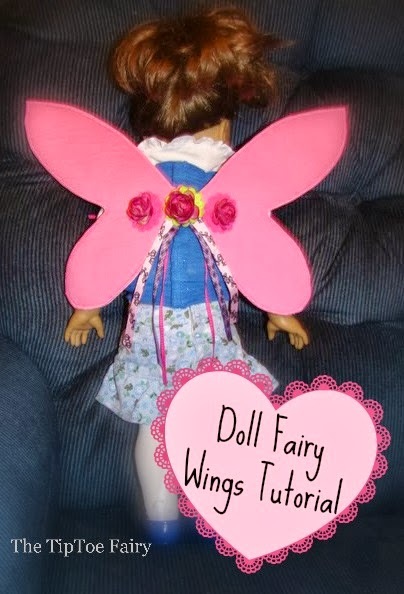 In honor of the American Girl Giveaway that starts tomorrow, I’m excited to be guest blogging over here at Diana Rambles with a fun doll fairy wings tutorial! I am Stephanie, from The TipToe Fairy. To tell you a little about me…I love cooking, baking crazy cupcake flavors, sewing, and all kinds of craftiness. I have two girls, so we have a rather large collection of American Girl dolls, Waldorf dolls, and lots of other dolls. Buying clothing and accessories for them can get rather expensive, so I prefer to make a lot of it. Making clothes for doll is so much fun! You can let your imagination go wild and make almost anything. I love to make fantasy play wear for my girls’ dolls like mermaid tails, fairy dress, tutus, and fairy wings. It really is very easy to do without a pattern. Plus, it’s so much cheaper than going to the American Girl store. 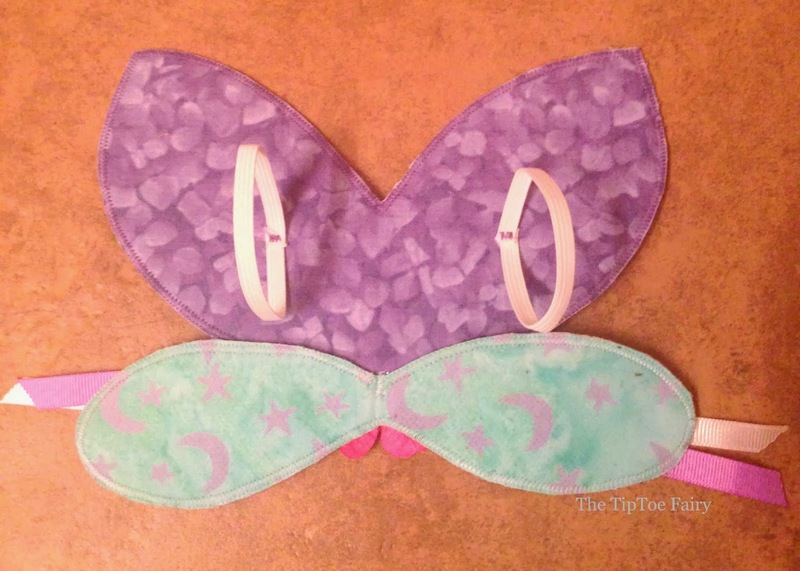 This tutorial will show you an easy way to make fairy wings! These fit perfectly on an American Girl doll or other 18-inch dolls. They are also fit well on 15-20 inch sized Waldorf dolls as well. I recommend using cotton wovens for the easiest wings to make. But, if you feel adventurous and aren’t a novice, go with something fun! Since it is important to go with natural fibers for Waldorf dolls, I love to use hemp silk or dupioni silk to make wings. They come out really lovely! 1. 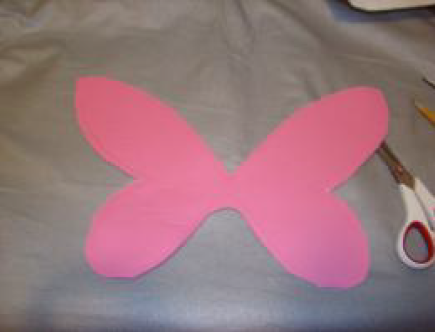 If you are making these wings for any other size doll, you will need to measure for your wings. If you are making this for an 18-inch doll like American Girl, just print and cut out the pattern. 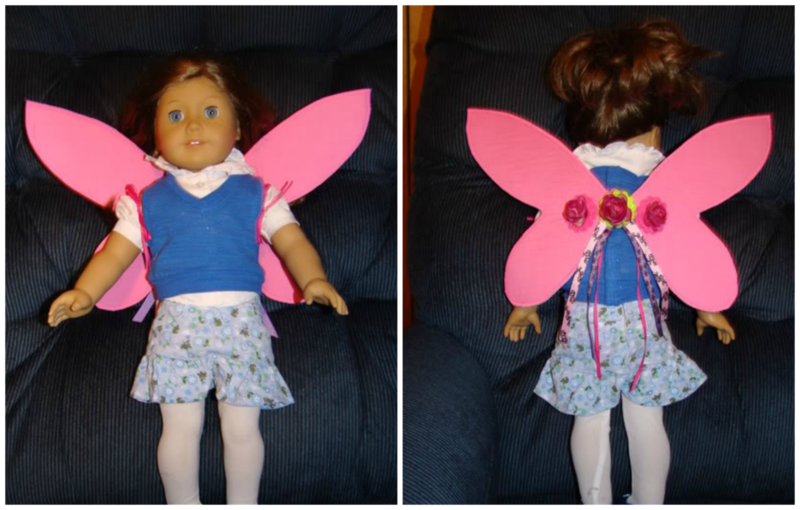 Measure your doll – first the width and second, the length by measuring diagonal to how far out you want the wings to be. For Amy, her width is 6 inches and length is 7 inches. 2. Take the 2 fat quarters and open them up flat with wrong side up. Take the fat quarter size of your fusible webbing (Heat n Bond Lite) and iron it to one of the fabrics. Then take the fat quarter size of Peltex/Timtex and iron it to the other fabric piece. Remove the backing for the fusible webbing and put the two fabrics with the fusible webbing facing the Peltex together and iron the fusible webbing to the it. **You don’t have to use the webbing, but I like to because it makes a better bond to together than just using the fleece. 3. If you made the custom wing size, draw out 1 wing. Then, cut it out. 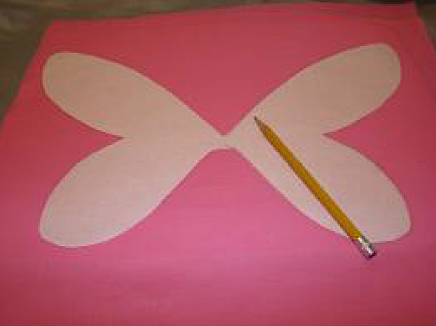 Take the paper backing you just removed from the fusible webbing, and fold it in half, and trace the wing so that you form a pattern piece with a full set of wings, and cut out. 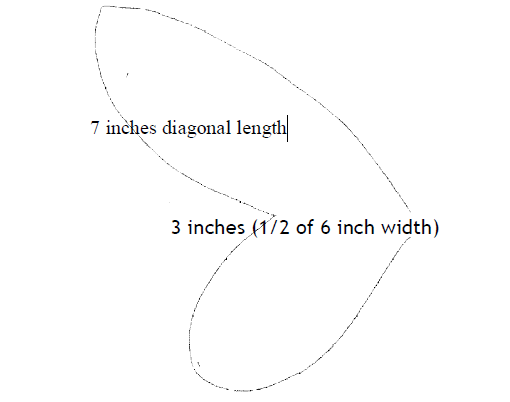 If you are using the pattern below for your American Girl size doll, then print it and cut it out. 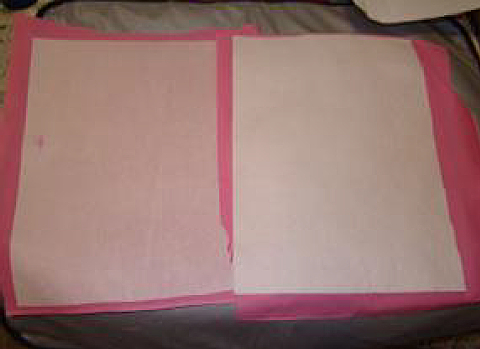 Then, take the paper backing you just removed from the fusible webbing, fold it in half and trace and cut out your full set of wings. 4. Take your new full set of wings and lightly trace it with a pencil or tailor’s chalk, or invisible marker on one side of the fabric. 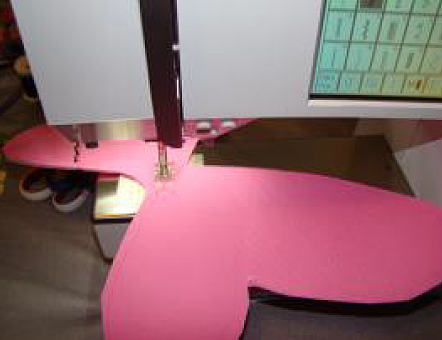 If you feel lucky, you can attempt using a small rotary cutter without tracing. I find this to be hard because of the tight curves. 5. Cut the wings out, leaving a small 1/4 inch sewing allowance on the edge. We will cut this off later. 6. Try to use a thread as close to the color of the wings, it makes for a more professional look. 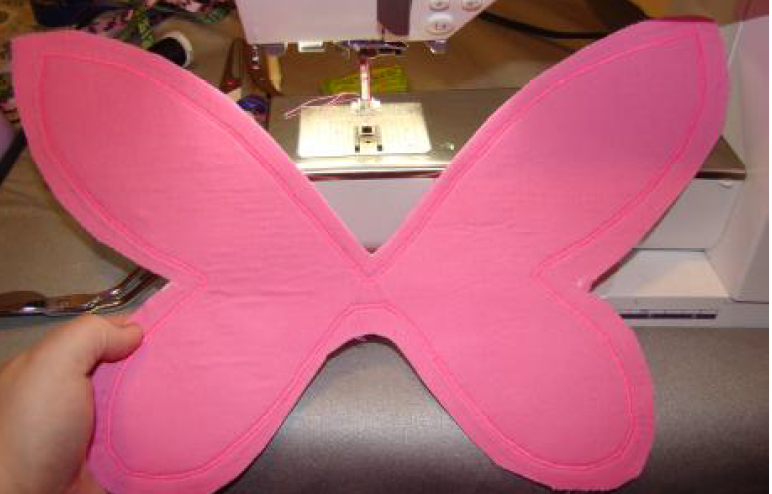 Using a zigzag stitch, sew a satin stitch around the entire wings, just inside your tracing. My sewing machine is a Bernina, and I put my stitch width on 0.5 and stitch length on 2. You might need to adjust yours if you have a different machine. Also, this is a fairly small stitch. Like applique, you do not want a wide zigzag stitch, it will show flaws. 7. Slowly cut around the entire wings to just at the zigzag. Be very careful not to cut threads. 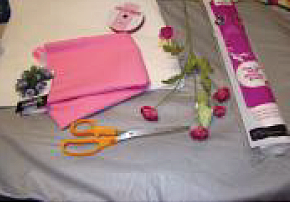 Applique scissors make it easy to get very close. 8. I did not take a picture of sewing the ribbon straps on. Here is a picture of the elastic straps. I have found through making a lot of these, I prefer the elastic because it requires no ties. Below method A is the ribbon ties and method B is elastic. A. RIBBONS: On the front side (the side against the doll’s back that is NOT pictured) attach 1/8 inch ribbons vertically. Measure out approximately 1.5 inches on either side from the middle of the wings. This will make the ribbons 3 inches apart total. Make sure your wings are laying vertically up and down, then lay each one out vertically on the wings, too. Then, attach each one with a small tack stitch, about 1/4 inch long. B. ELASTIC: Cut two pieces of 1/8 inch approximately 4.5 inches in length. Measure out approximately 1.5 inches on either side from the middle of the wings. This will make the elastics 3 inches apart total. Cross over the raw ends (leave a little extra you can snip off and tack them down with a zigzag stitch about 1/4 inch as shown in the picture. Then, cut off excess elastic edges. 9. The fun part! Now take the glue gun and attach fun stuff to the back of the wings – flowers, ribbons, pretty little felt things, button, etc. Go wild and make them your own! You can get the pattern to print out HERE on my blog.